- Start by checking the right side of the first room. There's a wall you can Bomb open to find a mighty five rupees in a chest. Woo hoo. - Return to the first room and lay a Bomb beside the orb switch on the left side of the room. Rush to the swirly platform in the south and get on. When the switch goes off the platform will carry you across the pit in the middle of the room. Pull out another Bomb and throw it at the blocked window on the right side of this platform to shed light on the eye here, which will unlock the northern door. Before you leave, Bomb through the floor in the northwest corner of the room. It'll be important later. - Pull out your Torch and walk north. After facing a piggish enemy with a steel helmet (you can take it out by knocking it off of the platform or using a Bomb on it), hit the button in the northwest corner of the room. This will spawn a Small Key in the southwest corner. Merge with the north wall and follow it south until you're just below the Key; a hidden platform will keep you safe as you retrieve it. Use it on the door in the north. - There are rolling boulders in this room. Merge past them and enter the northeastern door. - Beyond are three odd creatures, two green, one red. All will mirror your movements, and the red one will shoot fireballs if it's facing you. Kill the green ones with sword strikes and use Bombs on the red one. Get on the moving platform after the battle, and, at the top, use a Bomb on the wall directly south. In the next room, along with some ghosts, is a chest containing 50 rupees. You can access the bottom half of this room by running straight ahead when the moving platform is at ground level; down here you'll find a Monster Tail in a chest, and if you Bomb through the floor in the top-right corner you'll find a Monster Horn in a chest at the bottom. (I found this after the fact, so this is a little out of order with everything else. Sorry. Not really worth the bother anyway.) Return to the previous room and go out the door to your left. - Cross the bridge all the way to the west. Hop on the moving platform in the next room and lob Bombs at the two orb switches on the adjacent platforms. Triggering them both in a sufficient amount of time will reveal a chest containing a Compass. If you place a Bomb on the platform just as it's rising again and time it correctly, it will destroy the wall behind the platform and open up a chamber full of Fairies. - Return to the central room and look to your right. In a narrow alleyway near the northeastern door is a cracked floor. Bomb it to drop down onto a Small Key. - Go west. In the next room you'll run into a ton of invisible walls. Snuff the torch with your sword and make your way through the maze that appears. In the northwest corner of the room is a button, hidden beneath a skull, that will make a chest appear. It contains a Small Key. - Return to the central room and go east this time. Snuff the torch ahead to make invisible pathways appear. Make your way to the northeast corner to find another Small Key. 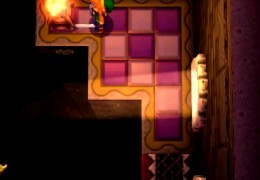 You can't reach the chest on the upper platform yet, but you can bomb the north wall of that platform and find a small cubby hole containing a lot of rupees. Leave the room through the door in the southwest corner. - You'll wind up in a large, southern room containing several things of obvious import. For now, go south and into the locked door on your right. - More greenies and a red to kill. Lure them towards the pit so they're on your level before engaging them. Once they're dead you'll activate a platform that moves between the two floors, ultimately carrying you to a teleporter back out of the dungeon. You can also go out on a platform up here and merge with the wall to travel west in the southern room; up here you can activate a switch orb that will reveal something important to the final puzzle of the dungeon. - Run west on the ground floor of the southern room to the opposite side. Another locked door awaits. In this room is a platform that moves from north to south, along three ramps leading to orb switches. Create Bombs while you're on the platform and throw them onto the ramps so they slide down, and trigger, the orbs. This will unlock a big chest containing the Big Key for the dungeon. - Go back upstairs to the first floor, and then onward to the second. - Walk a short ways south in the next room, then spawn a Bomb and pick it up. The floor will soon begin to fall away. Throw the Bomb up at the orb switch on your left to trigger it, then run down to the door in the south and go through. - The next room is nice and large. Stand on the conspicuous purple platforms inside and hit the orb switches to rise to the second level. Merge with the walls and move along them to outlying platforms which have access to blocked windows. Bomb the windows open. One more window in the west will have to be opened by lobbing a Bomb up. Doing all this will activate a series of light sources, beaming down into the pit surrounding this area. - Before leaving, merge with the wall on the ground level of the right side of this area. You can find a hidden chest containing Monster Guts. Then, returning to the middle of the room, plant a Bomb beside the southern orb switch. 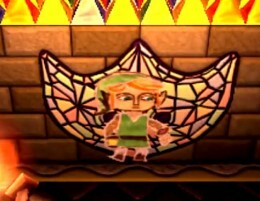 Run north onto the platform, hit the northern orb switch to make it rise, and merge with the picture of the mask on the north wall. If you're fast enough you'll swivel around and find a big chest waiting, this containing Master Ore.
- Return to the bottom floor. if all has gone to plan, the light sources you unblocked earlier will open the way to the big door. Go on through. - Light the two braziers in this room once you're ready for a scrap. That's one scary lookin' dinosaur thing. The Helmasaur starts out as you'd expect, stomping around its lair and trying to crush the life out of you. Occasionally it will stop to fire projectiles your way. Your attacks won't hurt it - unless they consist of Bomb blasts. Plant Bombs in the Helmasaur's path and they will, with time, damage its helmet and knock it off. Now you can strike its face and do more direct damage. Is that the end? Not at all. The Helmasaur will continue with its normal attacks, but it will also occasionally snuff out the two braziers in the room. When it does it will absorb the power of shadow, or something, and become invulnerable and extra-fast. Relight those torches immediately or you won't stand a chance. Once the lights are back on, press your attack until it goes down. 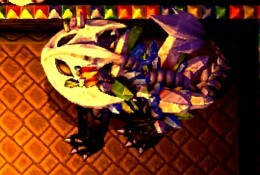 Upon beating the Helmasaur King you'll receive the usual Heart Container. You'll also free Sage Gulley from his imprisonment. Woot, only one left to go!